Back in the day (maybe 100 years ago), people used to dress modestly outdoors, even at the shore. Today, for an observant Jew, it’s very difficult to go the beach because you’re surrounded by immodestly dressed woman. Men want to reserve being sexually stimulated to their time alone with their wives and not cheapen the experience (or do worse things) because they’re stimulated by all the skin around them. The above a topic for another article, so what can we do if we want to visit the beach? If you’re in Australia, there are thousands of miles of mostly uninhabited beaches. You find one to go to with your family, and problem solved. If you’re in Israel, they’re are many beaches which have separate men’s and women’s sections. This has the upside of being able to go the beach all year round, but the down side of not really being able to go to the beach with your wife. In the United States, where I am, there’s another answer with it’s own up sides and down sides. Here, “Beach season” is from Memorial Day (late May) to Labor Day (early September). Pesach [Passover] usually falls out in late April, and Succos sometimes falls out in mid-September, making the intermediate days the best time for a trip to the beach as these are days when observant families generally take trips anyway, and hopefully, the weather isn’t too hot or too cold. 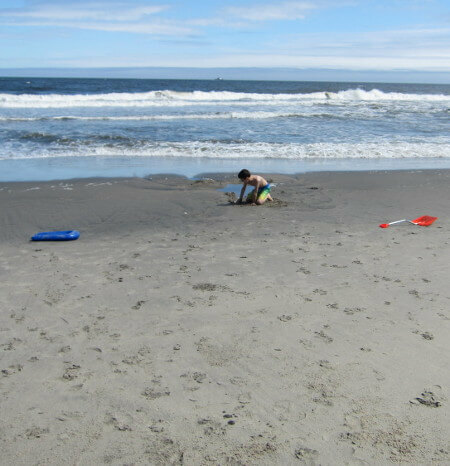 Or, we simply find a Sunday in May before Memorial Day or after Labor Day when few people are on the beach, find a empty section, and go have fun. The water usually the most temperate at these times, but that tends not to stop one of my sons from going in. A favorite beach for observant Jews is in Deal, New Jersey. The reason for this is simple – it’s a beautiful beach and kosher food is nearby. If you go, Down to Earth is fairly nice vegetarian / dairy restaurant. There is actually a large Sephardic Jewish community in Deal (with some very fancy houses, right up to the beach, as you can see – up on a hill and more protected than most shore houses). 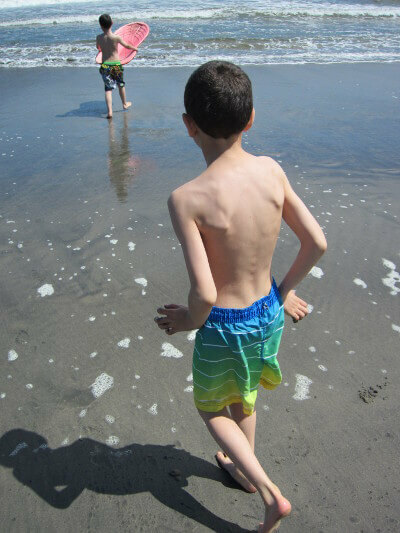 The other pictures of purposely obscured faces of kids in the ocean and digging in the sand are also in Deal. 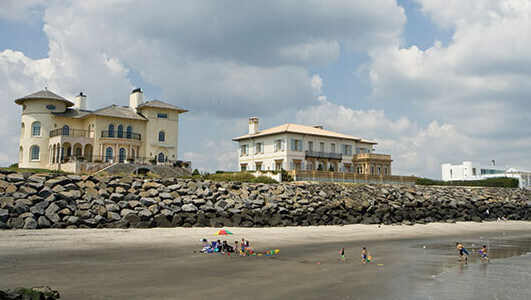 Other nice beaches include Sandy Hook, which is further North on on a long island with plenty of different beaches, and others which are just east of Lakewood Jewish community. Closer to New York City, there are beaches on Staten Island which aren’t nearly as nice (full of rocks, and pebbles, and lots of former now-cleaned up pollution) and Long Beach, the latter which is also very nice and near kosher food. Again, if you go in the off season, it’s pretty tame. Great and thanks for taking th time to post. Looking for foraward to taking kids to Deal today. Would you have a real estate agent/agency you may recommend? I am looking for a big beach house rental in/near Deal for August. For those that enjoy it or want to experiment with a new activity, Deal, NJ offers a wonderful location to explore on bicycles. And, I am including all ages, not just those who can ride. Perhaps in a future blog entry, I can describe how I managed to go biking in Deal with my family of six when only three of us were physically able to ride at the time.